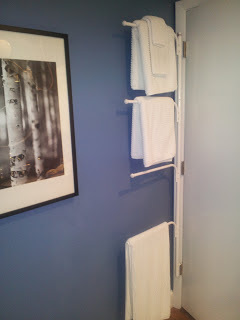 I have never been a fan of wall hung towel bars, you know the ones I mean. Everyone has the towel bar in their bathrooms that have the "just to look pretty" towels. You know who you are, and I have to admit I have been guilty of this myself in the past. In my guest bathroom, in an effort to end this nonsense and to create a place for towels to hang when I have guests, I found this great towel rack that hangs from the hinges of the door. Space for four towels and gets them out of sight.